The TERCYCLO was designed as a fun and simple, low cost Personal Mobility Vehicle that can be used on a daily basis for short trips. For the majority of people daily trips to work, school or other are about (30Km. or less) and most of the time by only one person . that’s why big and spacious cars are so popular but for 90% of the time it may just take you to work or the supermarket. You still feel compelled to buy spare space for those rare, crowded family excursions or surplus power for the motorway driving you would be doing once a month, but we decided to meet the requirements only of the average European journey, rather than all eventualities. People don’t travel far during the day as more than half of all journeys in Europe and the UK are less than 12km( 8 miles). City journeys are shorter, but take longer. A range of a little more than 25km would meet most of our daily requirements. These figures would probably be adequate for a single seater Cabin Scooter three wheeler and would make perfect sense as a fun urban vehicle. Ideally you’d want good acceleration from 0 to 65km/h and a top speed of 110km/h would be perfectly adequate to meet most daily driving. 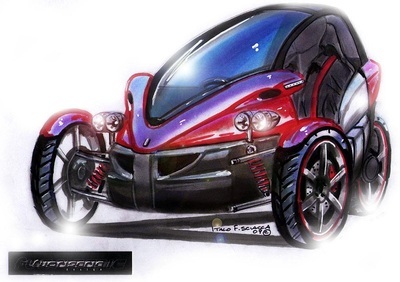 The Tercyclo evokes the shape of a Jet-fighter and is also influenced by modern day super-bikes. 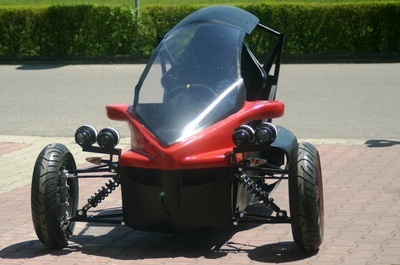 A single piece fairing/canopy tilts forward allowing easy access and exit. while reducing aerodynamic drag and providing wind and weather protection. The design was purposely kept light and simple with a back to basics design where the ease of assembly was the primary objective of the design. This class of vehicle falls in the Microcar/Quadricycles niche in the EU. This type of vehicle is licensed and insured as a motorcycle and would meet EU and MSVA in the UK. The TERCYCLO was designed by Italo F. Sciacca of FuoriserieDesign – Milano- Italy.